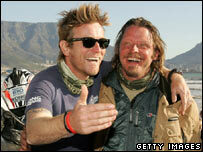 Actors Ewan McGregor and Charley Boorman have completed a 15,000-mile motorcyle journey from Scotland to South Africa. The pair arrived in Cape Town after a three-month trip which took them through 18 countries on two continents. The Long Way Down journey, which started at John O'Groats in May, was filmed for a BBC2 television series. They previously completed a 20,000-mile ride from London to New York, via Kazakhstan, Mongolia and Siberia. The trip to South Africa took the actors through Europe and then on to countries like Libya, Ethiopia, Sudan and Rwanda. Mr McGregor said: "The Long Way Down has been an amazing journey and it has been a real privilege to be able to experience these diverse and beautiful places. "We've had the opportunity to see such different ways of life to ours and have travelled to remote places very few people have access to. "The sense of freedom and exploration has been incredible." Mr Boorman said: "There were times when it was unbelievably hard going but that has been countered by amazing riding and extraordinary people. "Africa is a continent full of undiscovered wonder and we both feel incredibly lucky we've been able to experience this together and to have survived with some brilliant stories to tell."